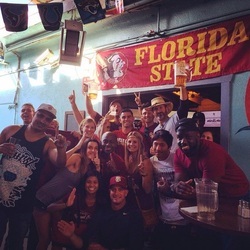 Even from 2,250 miles away, 'Noles love their sports!!! The LASC hosts game watching parties for football and other sports. For select games we have giveaways and raffles. So join us at one of the places below for some good food, good times, and Seminole victories!!! We highly recommend you take the Metro or Uber/Lyft. The red line is one block away on Hollywood & Highland. There are parking lots but they can get pricey, it is Hollywood after all. Buy a VIP Card in our store! You MUST be a VIP to take advantage of these specials! Overhead sound for each game. We recommend getting there early if you want a seat or even to get in at some of our bigger games. One table will be reserved for the Seminole Club Viewing Site Coordinators (first table to the left when you walk in) -- please DO NOT sit at this table unless you're helping us with the site. With that said, if you would like to volunteer to help us out, and get a guaranteed seat for every game, email us ASAP. ​​We highly recommend you take the Uber/Lyft. There is a small parking lot and street parking available. Want to be guaranteed a seat at every game, become a Viewing Site volunteer! Email us is interested. We recommend getting there early if you want a seat for the bigger games. We are usually in the bar on the right when you walk in. POWs also has a huge patio in the rear. We highly recommend you take the Uber/Lyft. There isn't a parking lot. Meters are on Ventura. There is a residential area but we're not sure if it's permitted or not. One table will be reserved for the Seminole Club Viewing Site Coordinators (first table in the VIP section) -- please DO NOT sit at this table unless you're helping us with the site. With that said, if you would like to volunteer to help us out, and get a guaranteed seat for every game, email us ASAP.